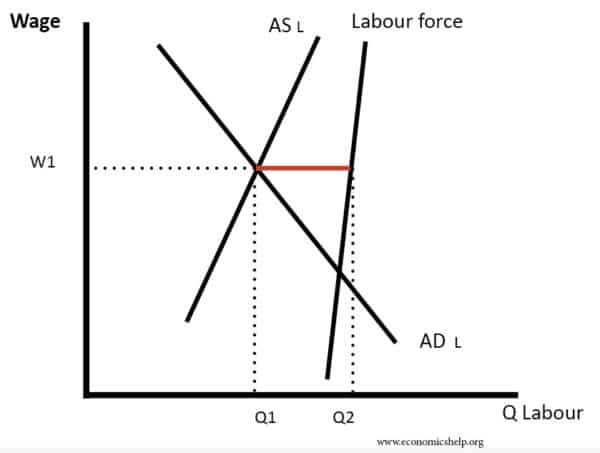 The natural rate of unemployment occurs when the labour market is in equilibrium; it is mainly composed of frictional and structural unemployment. The natural rate of unemployment is affected by supply-side factors such as geographical/occupational immobilities and labour market imperfections. 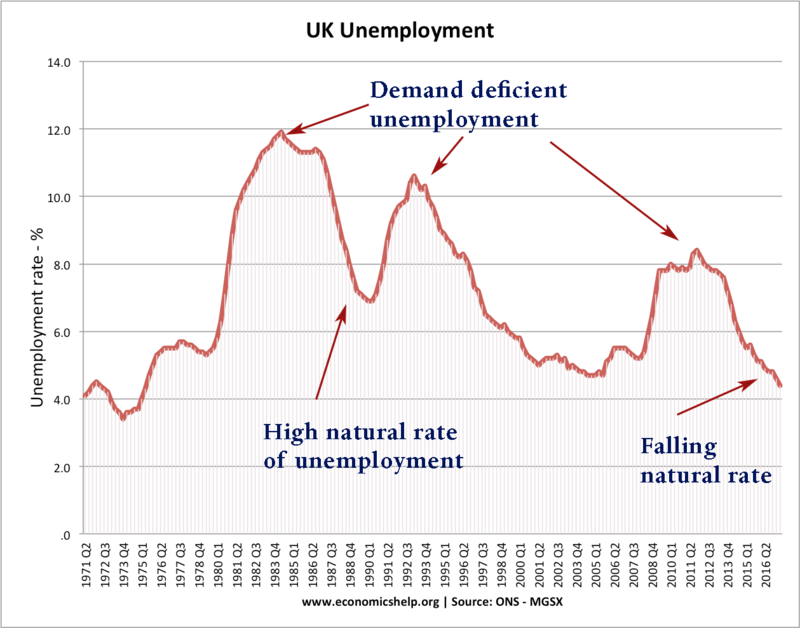 This suggests that the UK had a higher natural rate of unemployment in the 1980s. Even at the height of the Lawson boom – with high rates of economic growth – the unemployment rate was 7%. This rate was due to structural unemployment resulting from the decline in former manufacturing industries. The former manual workers struggled to get new jobs because of occupational and geographical immobilities. In 2017, the unemployment rate fell rapidly – despite relatively weak economic growth – suggesting a fall in the natural rate of unemployment. Similarly, the wages of the lowest paid will greatly affect the incentives to take a job. In the UK the government has introduced a national minimum wage and it has steadily increased. This has made work relatively more attractive compared to staying on benefits. A key factor affecting structural unemployment is the geographical and occupational mobility of labour. If workers were more mobile this would help reduce unemployment caused by a mismatch of skills and geographical location. For example in the past decade, the north-south divide has been reduced in the UK, this is due to regeneration in areas, which used to suffer high unemployment. New industries have taken the place of former heavy industry which has closed down, this has enabled a reduction in geographical unemployment. If workers become more skilled through education and retraining this would help reduce occupational immobilities. The flexibility of the labour market is also a key feature for determining the natural rate. For example, if restrictive practices of trades unions were reduced or minimum wages abolished, then labour markets will become more flexible thus firms are likely to be more able and willing to hire workers. 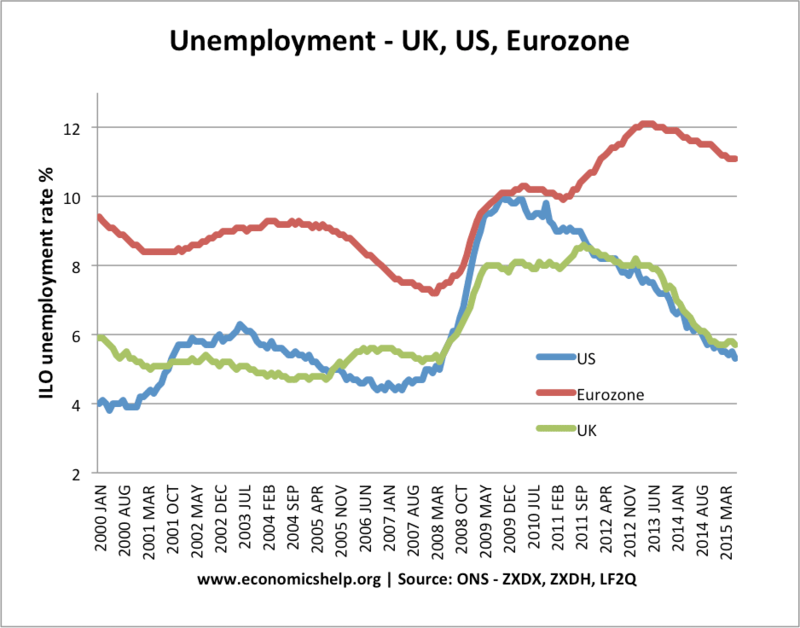 Arguably the UK labour market has become more flexible in recent years. For example, there has been a growth in part-time temporary jobs in the ‘Gig economy‘ There has been a marked rise in the number of zero-hour contracts. These jobs are lower cost to firms and so they have been more willing to employ workers because they can pay relatively low wages. To some extent, this increased labour market flexibility can explain a fall in the natural rate. Also, another factor explaining lower unemployment rates in the UK has been the growth ‘under-employment‘ a situation where workers are employed for a shorter working week than they would like. This means they are not counted as unemployed – but they are not ‘fully employed’ either. Higher unemployment in the Eurozone – even during a period of economic growth suggests the Eurozone has a higher structural rate of unemployment. By contrast, the Eurozone has seen a relatively higher natural rate – this is often blamed on inflexible working practices such as a maximum working week, restrictions on firing workers and more generous minimum wages. 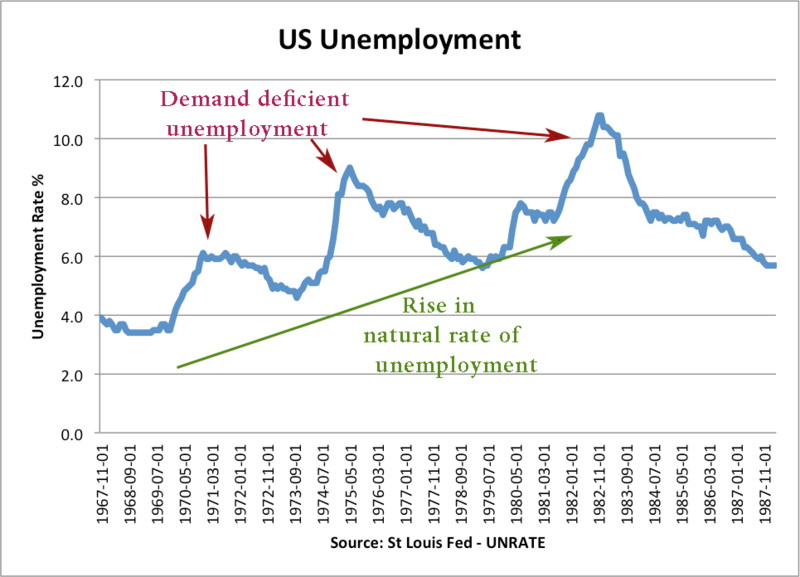 Another potential cause of the natural rate is the Hysteresis hypothesis this states that if unemployment increases (e.g. during a recession) then it is likely to remain high for a considerable period, this is because workers become de-motivated and de-skilled whilst remaining unemployed and therefore find it difficult to get a job in the future. For example after the recession of 1981 unemployment in the UK stayed close to 3 million for a long period despite a long period of growth, however, this didn’t happen after the 1991 recession. During the 1970s, the US experienced a rise in the natural rate of unemployment.